From the 1st century AD, Peninsular and Insular Southeast Asia has become the setting of a huge Indian influence. Practically, this Hinduisation consisted in new religious systems such as Buddhism and Hinduism, a new conception of the state and the introduction of writing. The opinions of the specialists differ on the origins of Hinduisation: whether they be the opening of new sea routes, or the necessity to stock up with gold or other motivations. One thing is sure: one of the earliest Hinduised kingdoms of the region, Funan, was born in the 1st century AD and existed until the 6th century AD. It is precisely in this period that the South East Asian scripts were born and we can follow their development until today. More than a century of research showed that the earliest SEA writing systems originated in a South Indian script used to write Sanskrit language. 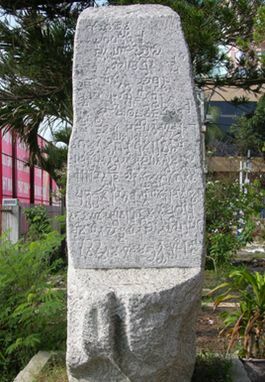 Everything begins by carving Sanskrit inscriptions in SEA and the oldest inscription in the peninsula dates back to the third century AD : The Vo Canh inscription discovered near Nha Trang, now central Vietnam. In a rather short time this Sanskrit script was used to write three languages spoken in the peninsula: the Mon language spoken at that time in Eastern Burma and in the Central part of what is now Thailand, the Cham language of the kingdom of Champa for which the territory roughly corresponded to what is today Annam and northern coastal Cochinchina in Vietnam and, finally, Khmer language. The oldest known Khmer inscription was found in Angkor Borei, now in Takeo Province. Angkor Borei may have been one of the capitals of the kingdom of Funan. The Angkor Borei inscription, listed as K 600, can be exactly dated to the year 611. The word Phnong, which is the name of the main ethnic group in Mondulkiri province, is also used in Khmer to designate the not so politically correct concept of savage. When the French scholar Georges Coédès writes that “Khmer is a Hinduised Phnong”, it is not at all a term of abuse, but a striking expression to describe the considerable distance between a tribal way of life and the then Hinduised Khmer world : religion, centralized state and, of course, script. In the following centuries, comparatively to Cham and Mon languages, Khmer written production can be characterized by an exceptional continuity. Let’s simply consider that we can follow the evolution of Khmer language and writing from the 7th century to the present day without interruption. In short, this amounts to say that Khmer cultural space is an essential key to the understanding of the past on the Southeast Asian peninsula. At this stage, one has to guard against the usual wandering error by being conscious that Khmer does in no way come from Sanskrit, even if as a consequence of Hinduisation, Sanskrit exerted a considerable influence on the lexicon of old Khmer and the neighboring languages. This deeply rooted prejudice apparently goes back to the first period of the French protectorate. This prejudice may have rooted in the attitude of the first French explorers who were very choked by the contrast between the “great ruins” and the state of decadence of the then Khmer country. Yet, Georges Groslier was very soon the tireless advocate of the Khmer patrimony: Angkor Vat may well be the greatest Hindu temple in the world, its architectural conception took its roots in Hindu religion, but as a whole the result is nevertheless unfailingly Khmer. As far as the language is concerned, no one can seriously challenge the fact the contemporary Khmer is directly derived from old Khmer pre-Angkor inscriptions. More than that: an 8th century Khmer text will be, at least partly, understandable to any knowledgeable Cambodian, whereas the Old English version of Beowulf would hardly be understood by modern English speakers? Cambodian space owns also a fair number of inscriptions in Sanskrit language of which the content is very different from the Khmer inscriptions. What is at stake in the 2 languages is very different. Sanskrit, as the language of Hinduism, is a vehicle of highly abstract literary, historical and philosophical texts. Sanskrit inscriptions are in no way rooted in the territory where they were carved: without exaggerating, one could say that similar themes can be found in Java, Champa or Cambodia Sanskrit inscriptions. The situation of Khmer inscriptions is totally different: of a far less degree of abstraction, they are entirely rooted in Cambodian realities: the building of temples, religious foundations and offerings, and as a matter of fact, they present a major interest for reconstructing the history of the Khmer land. Everything began in the end of the 19th century. What was then at stake was to construct the framework of a Khmer culture and the history of Cambodia. The Angkor temples forest may talk to the esthete, not to the historian. The latter’s requirements consist in interpreting, dating, reconstructing, explaining sequences of events and for all that, texts are needed. There exist of course many travellers’ accounts, generally Chinese, which are very valuable sources full of precious information, but the inscriptions were to play the decisive part to reconstruct Cambodian ancient history. A fantastic adventure followed where researchers like Louis Finot, Etienne Aymonier, Au Chieng and Georges Coédès won fame. Georges Coédès published in Hanoi in 1937 the first volume “Inscriptions of Cambodia” which was eventually followed by six other volumes published in France, the last one in 1966. The Ecole Française d’Extrême Orient (EFEO) was to play a key part in this adventure and its journal (BEFEO) began publishing, translating and commenting on inscriptions as early as 1904. Cambodian inscriptions make you feel dizzy: new inscriptions are still regularly found and they are very far from having been translated and commented upon. The implications of this fact are obvious: Cambodian general history may well be known, but there remain very many obscure points which will only be made clear when the inscriptions are deciphered. Thus there is a strong chance that a book about pre-Angkor or Angkor Cambodia written 20 years ago may be simply refuted by the discovery or the deciphering of an inscription. This has already been the case for a classic of its kind like Georges Coédès’ “History of hinduized kingdoms” or Laurence Briggs’ “The Khmer Empire”. During the meeting dedicated in 1999 to Georges Coédès in Bangkok, Michael Vickery, the author of the most recent and comprehensive survey about Pre-Angkor Cambodia “Society, Politics and Economics in Pre-Angkor Cambodia”, declared abruptly but not without reason that: “To study nowadays Cambodian history with Coédès would amount to do geography with Ptolemy”. The historical aspect of epigraphy is one well established thing, but the inscriptions were sometimes going to play another part. The content of an inscription (temple, foundation, offerings…) is one thing, the nation-states’ later political use of the inscriptions is something else. The principle is as old as the world and could be summed up as follow: “I was here before you” and for that, there is nothing better than the perpetuity of the inscriptions. In 1834, Mongkut, a Buddhist monk discovered an inscription that, according to him, had been carved in 1292. 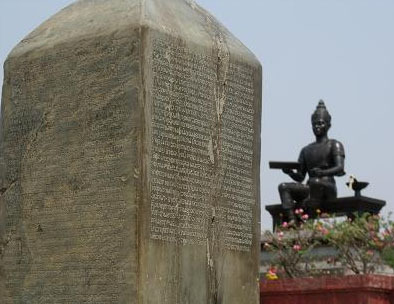 The inscription being written with letters very much like modern Thai letters, it was immediately considered as the first text ever written in the Thai language and not by just anybody but by the king Ramkhamhaeng himself, who became de facto the inventor of the Thai script. From then on, the inscription was named after him. Till then the very existence of this king was not too clear and he was even considered as legendary. Even today we are not entirely sure about the time of his birth or death: 1279 – 1298 or 1239? – 1298 or 1239 – 1317… Well, we are not going to quibble about such insignificant details. Didn’t a good old religious tradition teach us that to make a saint from someone it’s better to wait for his death to avoid further disappointments, and it is even better that he had never existed. Mongkut’s story didn’t stop there as he became the king Rama IV and ruled over the kingdom of Siam from 1851 to 1868. It’s under his rule that the Ramkhamhaeng became a major element of the Thai national patrimony. For the history of writing which has the arduous task to reconstruct the conditions of the evolution of the various scripts, the influences and the borrowings, the Ramkahmhaeng is an incredible challenge: the only case when a very much developed script literally came out of nothingness, nothing before, nothing after! In 1986, one of the most famous Thailand art critics, Piriya Krairiksh, put forward the opinion that the inscription, according to him carved by Mongkut – Rama IV himself, only dated back to the 19th century. Michael Vickery, whose greatest quality is certainly not mercy, followed close behind him in the 1987 Canberra conference on Thai studies, did it again in a 1989 article and, in 1991, he summarized his major points which were to be published in a 1995 issue of The Journal of the Siam Society. His article is based on a very deep analysis of the language, script and context: the context of the Ramkhamhaeng is not 13th century Sukhotai and the question to know if this script could have been invented by a genial king is at best meaningless: “There are certain questions and criticism which I shall not attempt to answer, and which I think are unanswerable, not because they are weighty, but because they are outside the realm of scientific discourse within which historians and linguists must work. For example, I shall make no attempt to counter arguments of the type, « why couldn’t a great genius, such as ‘Ram Khamhaeng’ devise from nothing a perfect writing system? » This question is unanswerable. We cannot say in a scientifically provable way that a great genius could not have done that, but all we know about the development of such cultural items suggests that if not impossible, it is extremely improbable”, Vickery wrote. Till then, the polemics had been restricted to academic discussions summed up by John Chamberlain’s book “The Ramkhamhaeng controversy” which was published in 1991. Academic discussions of this kind may allow expressing reservations, but they will never result in a total calling into question. That would be an incredible loss of face: one would have to rewrite the parts of historical books where it is told about the Ramkhamhaeng, to take out of the Thai language handbooks the sentence according to which “modern Thai script dates back to 1292 and was invented by king Ramkhamhaeng”, without talking about the traditional universally celebrated Gelb’s and Février’s handbooks about the history of writing. The icing on the cake would be to expose the trick of Rama IV’s, a revered king. An American academic offered a pedagogical example: “imagine that tomorrow we are told that our constitution is a fake”. Things could have only got that far, but something else was to happen. In 2003, The Ramkhamhaeng was submitted by the Thai government for the registration on the world patrimony list. This had many consequences such as total dissociation between the decision of the Thai government taken on purely political grounds and the choice of many Thai intellectual not to overlook the debate. The debate is highly interesting because it teaches a lot about the maturity of Thai academic. 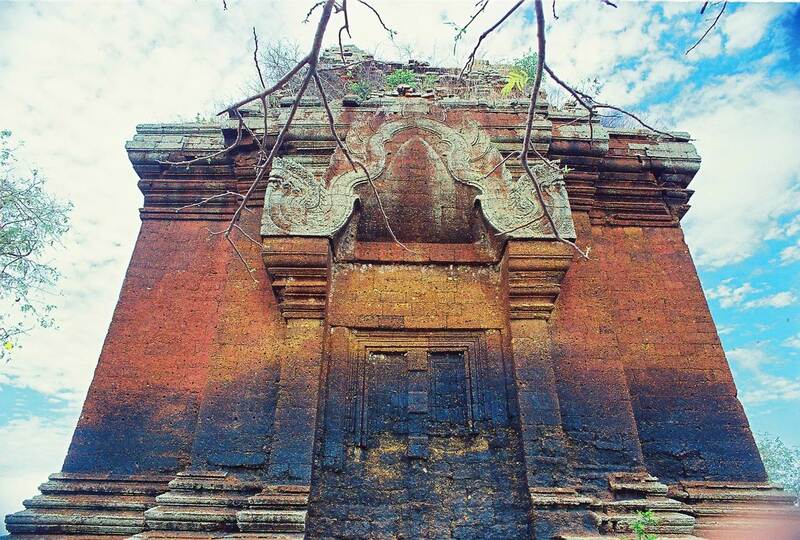 The Preah Vihear affair revealed a Thailand that yielded in to xenophobic temptation. Here, there is nothing of the kind because the demarcation line is between Thai. The authentic of the Ramkhamhaeng is not essential. But there is a strong uneasiness resulting from the will to conclude politically the discussion about a rather doubtful case. Thai academics’ pride has been deeply hurt when for instance the politician Boworsak Uwanno accused them to “destroy national unity” just because they put forward doubts about the authenticity of the inscription. It is precisely this kind of uneasiness that Mukhom Wongtes analyzed in her excellent book: “Intellectual Might and National Myth: A Forensic Investigation of the Ram Khamhaeng Controversy in Thai Society”, it is a remarkable indictment of the Thai political community meddling tendency and the necessity for the intellectual to keep its independence.